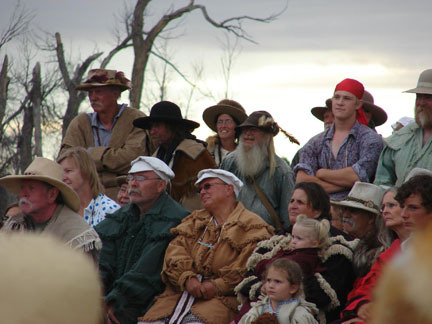 The Rocky Mountain National Rendezvous Association (RMNR) is dedicated to the re-enactment of the Western Fur Trade era (1820-1840). Although we are also aware that there are more time periods represented at the RMNR and so have included from 1700's to 1840's. We try to educate the public and participants of the importance of recreating accurately the history of each of the time periods. This allows the participants to develop their persona and outfits for a wider range of time periods. We discourage the "mix" of time periods and geographical areas. As a federal tax exempt organization (501(c)3). The Rocky Mountain National Rendezvous Association is required to have a Board of Directors. Our current Board consists of seven people who were elected at the annual meeting in July to serve for 2-3 year terms. The RMNR is held each year on the second full weekend after the 4th of July. We elect a booshway or booshways two years in advance. If you are interested in running for booshway in one of the states represented (Colorado, Montana, Wyoming, Eastern Utah, New Mexico), please read the information below. If you have any questions, please feel free to contact any of the board members as they are all past booshways. Do You Have What It Takes to be a Booshway? Are you an active primitive buckskinner? Do you enjoy organizing? Are you ready for a bigger challenge? The Rocky Mountain National Rendezvous (RMNR) just might be looking for your help! As you may (or may not) know, the RMNR tries to rotate among the states of Colorado, New Mexico, Idaho, Wyoming, Montana, Utah. 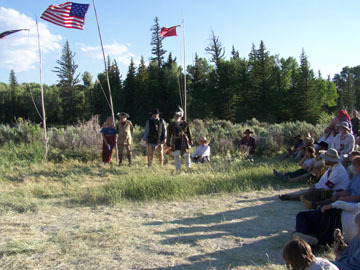 A typical rendezvous draws between 350 to 800 camps; participants come from all across the United States and many foreign countries. 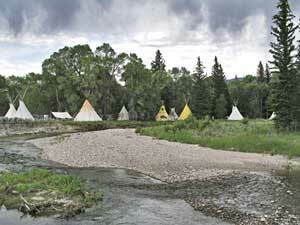 The reason folks travel to attend the ten day long encampment is that it is strictly a pre-1840, primitive rendezvous. It's a learning rendezvous, with seminars on primitive skills and crafts seminars throughout the rendezvous. In addition, there are competitions like: shooting, hawk & knife throw, archery, trail walks and where available water games. The RMNR is a "closed" event with possibly one or two open days for the public. The rest of the time it is pure unadulterated history come to life. The 10 day event is usually held the first full weekend after the 4th of July. What about being a Candidate for your State? The RMNR Chiefs' Council and Board of Directors are actively soliciting booshway candidates to bid on upcoming RMNR. Candidates bid for 2 years ahead, i.e. at the 2016 event, you bid for 2018. You don't necessarily have to be from one of the above states to be a candidate, but your co-booshway or segundo should be because you will need to coordinate hooters, water, site arrangements, etc. It begins with two individuals putting together a site, support staff and great plans. They must first meet with the Chief's Council (the past booshways). The council reviews the proposal, and works with the candidate(s) to strengthen weak spots and anticipate problems or questions. Next the candidates are nominated during the camp meeting. The following two days the candidates campaign to win the bid. Then the final vote is cast by the camp (usually at the Thursday camp meeting). The elected co-booshways are supplied with a guide booko and seed money the prior year of the rendezvous. The amount is determined by the bylaws and the board, depending on the needs of that rendezvous. From that money, the co-booshways and their staff are reimbursed for certain direct expenses including advertising, printing, medallions, building supplies, phone calls, gas to and from the site, and others. It's certainly not an opportunity to get rich, but instead a way to minimize out-of-pocket expenses for the co-booshways and their staff. What's Needed to Make A Bid? CO-BOOSHWAY: A leader well versed in primitive rendezvous, with some experience in organizing services and activities for large groups of buckskinners; a coach, a mediator, an enforcer, a carpenter, a public relations expert, a landscaper, a plumber and more i.e. chief cook and bottle washer. We don't ask much. SITE: Capable of handling 350 to 800 camps (approximately +/- 100 acres); reasonably accessible, with water, wood and hooters or ways to supply them. 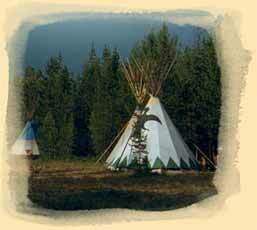 Must have short and long term camps, traders row; can have modern camp (tin tipis) but not required. STAFF: The smartest co-booshways surround themselves with people who are expert in areas where they are weak. Staff positions can include a segundo (asst booshway), purser, range officer, dog soldiers, horse camp chief, hawk and knife range officer, trade chief, primitive archery, kids games, seminar organizer and more. Well...When you, as co-booshways, see a small city suddenly erupt from a cow pasture, complete with commerce and kids at play... When folks complain that they aren't getting enough sleep because they are having too much fun... The quick handshake as buckskinners are leaving and a heartfelt "Good Job" or "I'll be back next year"...it's all worthwhile. And besides, you'll join a very elite group of individuals who have been as crazy as you to take on this task! When Do I Bid? Who Do I Talk To? The Chief's Council meeting is usually set for the Tuesday into the rendezvous in the morning (around 9 or 10 a.m.) If you have any questions about running, please contact one of the board members or one of the chief's council.